Indians have always been fond of gold items owing to which we are the top consumer of this precious metal. The most liked item that is purchased by every individual is a gold chain. But the other bitter truth of life is that when gold turns old it does not look attractive and there may be a dark discolouration. Going out in the public wearing this type of gold chain will make you feel awkward, this is pure human nature. Everybody wants to buy & wear new gold jewellery which gets appreciation from the others. Many people don’t realize that old gold chain also hold a satisfactory price which can be availed by selling it. The big question remains where to sell my gold chain for maximum cash which can be sorted out by little smartness. In Delhi NCR region there are numerous cash for gold dealers which is a big asset from the customers’ point of view. But at the same time, this makes the situation tricky also as you have to select the best gold dealer. In this process, the internet can help you a lot in finding the right place that gives you the most value for the gold. Just search for where to sell my gold chain this will display various vendors on the World Wide Web. You can see the past reviews of the gold dealers given by the customer and take a decision accordingly. The gold buyer should be using the present day techniques for gold chain evaluation and do ethical deals. 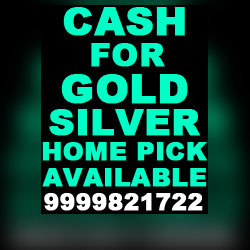 Our company, Cash for Gold Delhi NCR is ranked as the premier purchaser of Gold, Silver & Diamond in the NCR territory. We are purchase old, new and broken gold & silver jewellery and give the best price to the customer with up to 4% extra cash. Above all, we give live market rates to the customers and ask for minimum documentation. Visit our outlet today for getting the extraordinary deals. « How to find a trusted gold buyer in Delhi NCR?